We will call this the "before" picture. The first thing I did was scratch up the surface of the shoes with some sand paper. I didn't spend too much time or effort into this, just enough the give the surface some texture. Then I took the shoe laces out. Next, I taped the soles of the shoes with painter's tape to keep the glue and glitter off. We want a nice clean sole in the end. The next step would be to mix equal parts glue and glitter. You could put a little less glitter than glue since we will be adding more glitter shortly. 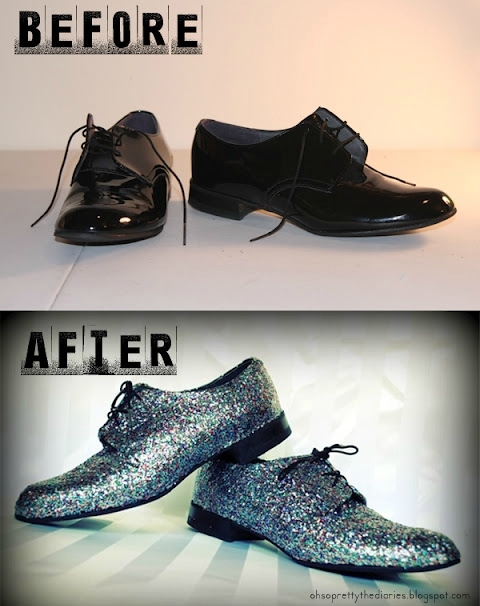 I took the glue mixture and put a thin layer all over the shoes, not worrying about the equal spread of glitter. After letting the glue dry, I added another very thin layer of glue mixture and immediately poured glitter all over the wet shoe. After the shoe was covered in glitter, I took the glue mixture and sponged it over the dry glitter to push it into the shoe's surface. (I did this on a sheet of paper to be able to pick up the unused glitter and pour it back into the jar.) In this step, you want to make sure you have covered every part of the shoe in glitter, without creating a lumpy texture on the shoe. You want the glitter to be as even as possible before it even starts drying. This is what the shoes looked like after I finished adding all the glitter I needed. When the shoes had completely dried (I waited over 24 hours) they looked like this. I then took a glossy finish spray and sprayed the shoes twice, waiting 20 minutes in between each spray. I let the shoes dry for another 20 minutes and then removed the painter's tape very very carefully. You must do this slowly because some of the glue mixture will peel off. Re-lace your shoes if needed and there you have it! Glitter shoes all of your own. 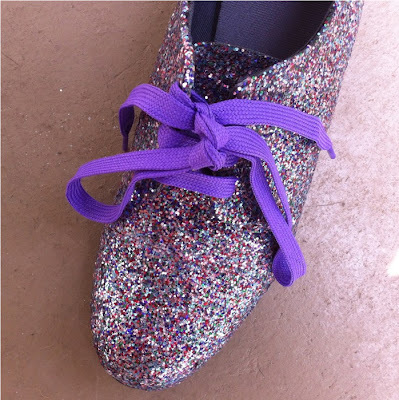 I did this once years ago and the glitter cracked and fell off as I wore the shoes. Did this method work with wearing for you? These shoes have only been worn once and it wasn't for very long. They did crack a little and some glitter fell off but not much. Martha Stewart makes a glitter paint that is supposed to work really well too and you can do the same thing.